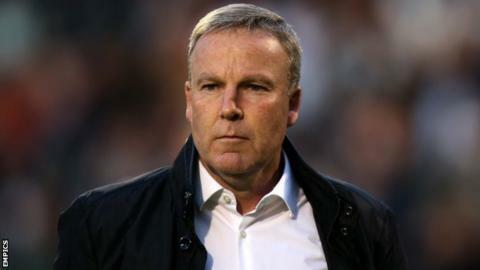 Wolves boss Kenny Jackett says that "it wouldn't work" if he did not have the final say on any new potential transfer targets at Molineux. Like neighbours West Bromwich Albion, Wolves are one of the few British clubs who operate with a head coach of their first team, rather than a manager. But Jackett said: "If someone was signed I didn't want it wouldn't work. "You'd be wasting your money. If I had a look and said 'in no way do I want that one', it would be written off." The Wolves head coach, chasing a second promotion in successive seasons since taking charge, works in tandem with head of football development and recruitment Kevin Thelwell at Molineux. And he totally dismisses the notion, as has happened at other clubs, that a player could potentially be signed without his approval. "It doesn't happen here," he told BBC WM. "People wouldn't bring players into the club that the head coach doesn't want because obviously it wouldn't work." Kenny Jackett was at a football forum hosted by BBC WM's Paul Franks at Molineux on Tuesday night, of which lengthy extracts can be heard this Friday evening on WM 95.6, DAB and online from 19:00 GMT. Since the January transfer window reopened on 3 January, Jackett has already brought in Arsenal striker Benik Afobe, who scored on his debut in Saturday's 2-0 home win over Blackpool. But he admits that the promotion-chasing Championship club are looking to make one more signing, probably another front player, before the window closes again on 2 February. "I wouldn't say we're close or that we'll have a new player in by Saturday or anything like that, "said Jackett. "But over the last few weeks we've looked hard and we've talked to several possibilities. "There may be one, if the right player comes up, probably in a forward position, but there won't be wholesale changes." You can listen to BBC WM 95.6's fans' forum with Kenny Jackett from 19:00 GMT on Friday, 23 January.